This post contains affiliate links to the products I promote. A small commission may be earned if you purchase these items (at no extra charge to you). I was not compensated for writing this article. These are my own reviews and opinions. Click here to read my full disclosure. Does Holiday gift giving stress you out? Yea. Me too. We have become so obsessed with Holiday giving, haven’t we? We spend a tremendous amount of money to find that perfect gift when in reality, that expensive perfect gift will end up in the back of a closet a few months from December 25. I remember when I was about seven years old and my sister was four we had one of those holidays. My mom had bought me a crayon set called “Clowny”. You put the crayons on your fingertips and colored with them. It was back in the day, folks! My sister, on the other hand, had been asking for a toy vacuum. My parents and grandparents looked high and low for this toy vacuum. They finally found one. When I opened my “Clowny” and my sister opened her toy vacuum, World War 3 erupted. She wanted the “Clowny” crayons and hated the toy vacuum that she had begged for. I remember crying, yelling, just crazy behavior on all parts. Looking back, we all get quite a laugh about it. Christmas has become so commercial that we get so wrapped up in the gifts that we forget the giver and the heart behind the gift. More importantly, we forget the Giver of Life. We forget WHO the season is actually celebrating. We forget (pardon the cliche) the Reason for the Season. Our Lord and Savior Jesus Christ was born. That should be the focus. Steven and I decided that no longer are we going to fill the bottom of the tree with crazy amounts of gifts. We weren’t going to break the bank just to give each other and Asher hundreds of presents. We decided a few years ago that we are SIMPLIFYING Christmas, and putting the focus back on the Greatest Gift we could ever know. We follow a Four Gift Rule. We follow this pattern with our whole family. Everyone gets four gifts. No more. We found that by SIMPLIFYING our Christmas gift giving, we are intentionally focusing on each person. We LOVE shopping together for Asher, Mom, our sisters, and brothers. It has brought us so much joy to think about each person we are shopping for and really taking into account what they love, who they are, and what would bless them. To me, the perfect gift to give and receive is the Word of God. I can think of nothing better to give. It is living, powerful, and active. It changes hearts and lives and salvation through Jesus is the greatest gift we can receive. But with so many Bibles on the market, it is hard to know which one to pick. 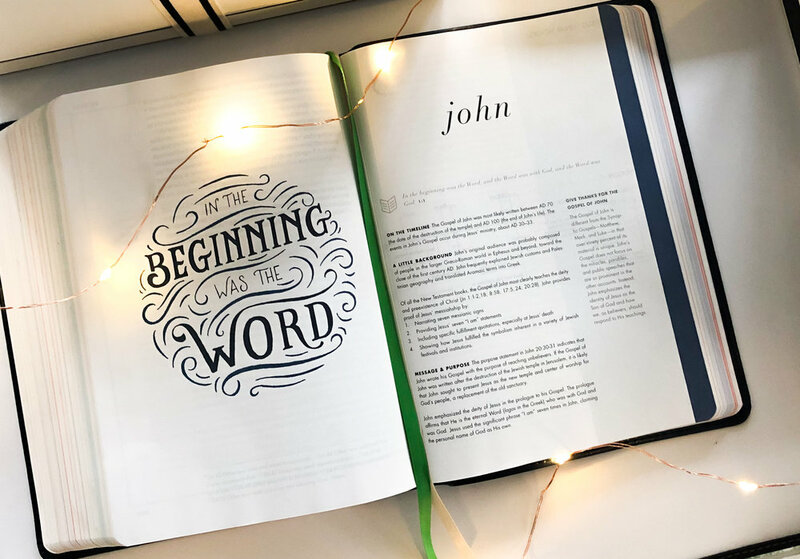 I recently spoke about choosing the BEST BIBLE TRANSLATION, but now let’s talk about some of the best Bibles you can give as a gift not only for Christmas, but beyond. I want to share with you the best Bibles for the men, women, and children in your lives. Study Bibles, Journaling Bibles, Oh My! As I mentioned in this post, my favorite translations are the New King James Version, the New Living Translations, the English Standard Version, and the Christian Standard Bible. I will be sharing the best Bibles from those versions. They are easy to read, easy to understand, and most importantly, doctrinally accurate. I have personally used each and every one of these Bibles and can vouch for their beauty, durability, accuracy, and ease of read. Plus, most often then not, you can get each Bible quickly on Amazon Prime. Great for the last minute shoppers among us! The Illuminated Bible English Standard Version is a gorgeous Bible with plenty of room to journal and take notes. It is absolutely beautiful. I have the navy blue hardcover (and I just bought my sister the green for Christmas. SHHH!) This is my favorite ESV Bible! The She Reads Truth Christian Standard Bible is an excellent Bible featuring devotionals by the She Reads Truth team, and Scripture reading plans that include supplemental passages for deeper understanding. The pages are thin, but as you can see in the photo above, you can still journal and make markings without too much bleed through. It is incredibly easy to understand and Biblically accurate. I have the Grey Linen Hardcover and it has held up very well. The NKJV Life Application Bible is the greatest Study Bible I have found. I have been using this Bible for over twenty years and I still get so much from the passages. It contains thousands of Life Application Notes to help readers apply the truths of God’s Word to everyday life. Includes book introductions, in-text maps and charts, personality profiles, and more. These are my journaling Bibles, and I have personally used each and every one of these Bibles and can vouch for their beauty, durability, accuracy, and ease of read. The INSPIRE BIBLE is the perfect Bible for every Bible Journal Artist. Featuring beautiful coloring pages and plenty of room for notes. It is the perfect Bible for the artistic and non-artistic among us! It is the first Bible of its kind―with over 400 beautiful line-art illustrations spread throughout the Bible. Full-page and partial-page Scripture art is attractively displayed throughout the Bible, and the illustrations can be colored in to make each Bible unique, colorful, and customizable. Hey Guys and Gals . . . Steven, here. Erika asked me to help pick out my favorite Bibles for men. I thought it best to divide these into two sections for you; study Bibles and regular Bibles. I am sure the guys are with me, we like simple. You ladies can have all the fancy Bibles, but give us simple and we are happy. Here are some of my favorite Bibles. I personally recommend these and hope that you, or the guy in your life, loves these choices. Like Erika mentioned above, my favorite Study Bible has got to be the Life Application Study Bible. I personally use the King James Version, but also like the New King James. I have also listed some other Study Bibles which I highly recommend. These are my go-to Bibles when I just want to read. Sometimes, you need to step away from a Study Bible, no matter how great they are, to just hear God’s Word for yourself. When I just want to read without any distractions, these are the Bibles I love. Again, I am a King James guy, but the English Standard Version and Christian Standard Bible are also very accurate. Our teenagers need Jesus, y’all. They need to know who they are in Christ. They need to know that in Jesus, they are complete. The suicide rate in teens is rising. According to an article in USA Today, “The suicide rate for children and teens between 10 and 17 was up 70% between 2006 and 2016.” Our teenagers need Jesus, my friends. These are the best Bibles for teenagers to get to know who they are in Christ and His design for their life. I homeschool my son, Asher, and we have Bible class as part of our morning curriculum. These Bibles have been wonderful. They keep him engaged, and he is learning so much about God’s Word. the Bible says in Proverbs 22:6, “Train up a child in the way he should go: and when he is old, he will not depart from it.” A Bible is the best way to train up that child and to teach them the way of the Lord. Whatever you are celebrating; Christmas, Easter, a birthday, or an anniversary . . . or even a personal renewal of your faith . . . these Bibles will be a blessing in your life. I can personally vouch for all of these Bibles. I have used them at home and in ministry, and am blessed every time I open the Word to hear His voice. May these selections bless you and your families as you grow in Christ together. YOUR TURN: Which of these Bibles are on your wish list? Which is your fave? Let us know in the comments!